Another month has come and gone. 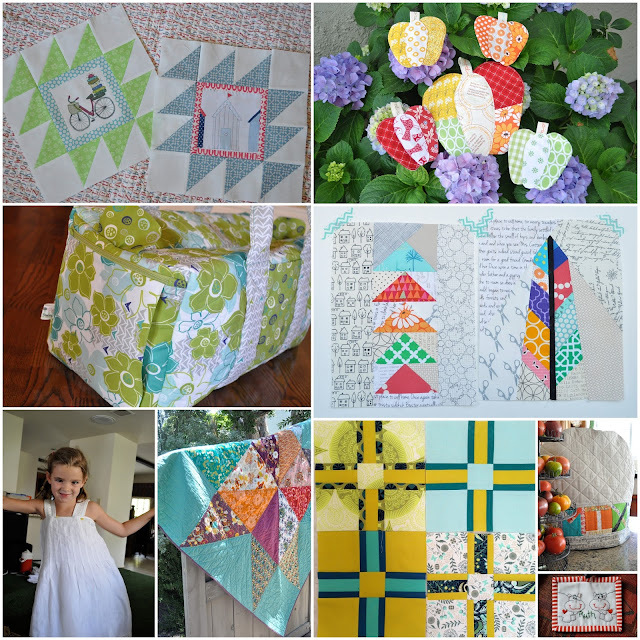 I am linking up with Lynne at Lily's Quilts to be accountable for the projects I have made in June. Ugh! The year is half-gone! 1. Rocky Mountain Bee Blocks with a fussy cut center for Susan. Modern Stitching Bee. 2. Zakka 2.0 Along Coasters and Hot Pad made from the Patchwork Please book. 3. Travel Duffle Bag, downsized from the original pattern. Made with Modern Yardage fabric. 4. Paper pieced flying geese and feather blocks for Katy Stitch Tease Bee. 5. Refashioned my skirt into a sundress for my granddaughter. 6. Finished the Indie Star quilt and donated it to Oklahoma Tornado Relief. 8. Mixer Cover, my version of Zakka 2.0 Along Tea Cozy Project from the Patchwork Please book. 9. Name tag for my Fat Quarterly Retreat partner. 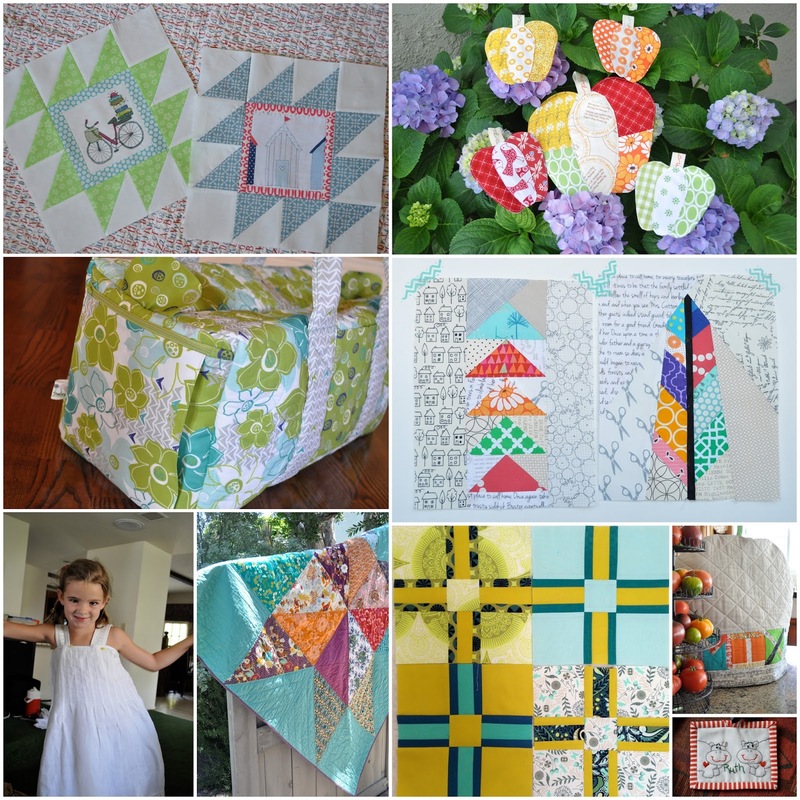 I pieced together the blocks from my month as queen in the Stitch Tease 2 bee. I made 9 blocks before the bee started to give the girls an idea of what I wanted and then I made another 11 this month. This quilt will measure 72" x 84" when finished. I wanted a nice sized quilt to use at the beach. I might just put this at the top of my Finish-A-Long list for the next quarter. As well as my sewing projects, I like to link up my canning and baking projects too. 1. My first time to make Kimbucha. It's delicious! 3. 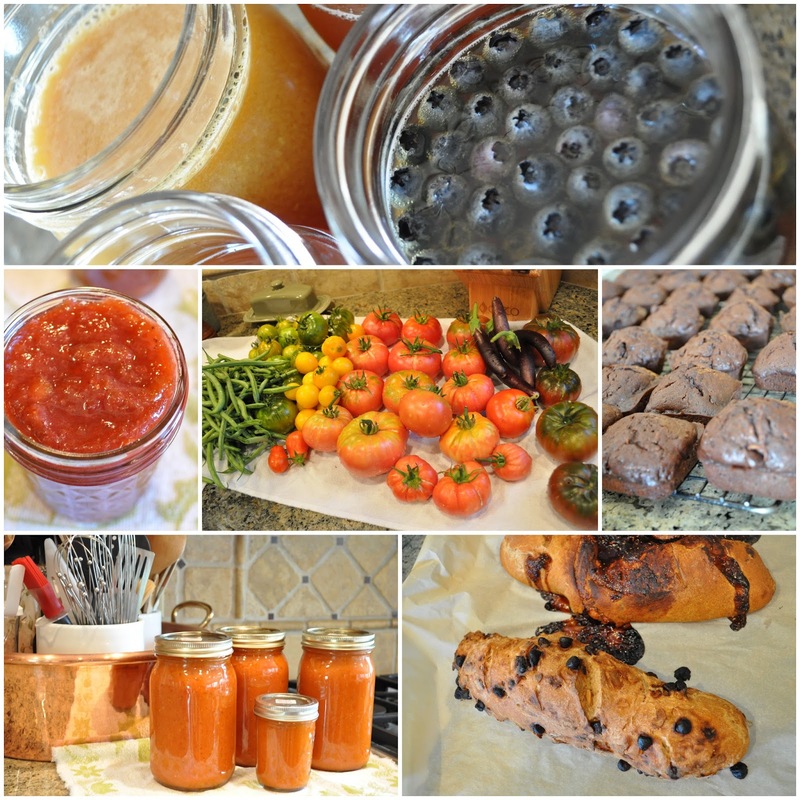 With our garden harvest there is always cooking and canning to do. 4. Double Chocolate Zucchini muffins. 6. I discovered a new bread recipe, so there has been lots of experimenting with different breads. I love my bee blocks! 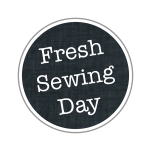 But all your fabric creations are always lovely! And I think you already know how wonderful your garden is! Wow, wow, wow, all gorgeous Di! 2) I'm coming for dinner. Love your projects! Lovely colours and very diverse!!! I LOVE the way that Stitch Tease 2 quilt turned out. Beautiful. Seriously can not wait to see it all quilted. You always amaze me on how much you accomplish each month. Great job Di! Obviously I am going to say that the ST top looks amazing!!! I am in love with your travel duffle bag. I love everything about it. I also love your beach blanket. Excellent work and so very nice to meet you.